Kottayam Nazeer, one of Kerala's leading mimicry artists, makes a sparkling debut as a painter. As we walk around Kottayam Nazeer’s exhibition, ‘Dreams of Colours’, at the Durbar Hall Gallery at Kochi (October 2-18), there’s one painting above all catches the eye. It is a black-and-white image of an elderly man, with oversize black spectacles, piercing eyes,a lined forehead and wavy white hair complemented with a walrus moustache. A closer look reveals that the moustache is actually two white polar bears, the nose is the back of a frog, the eyes are two fishes, the eyebrows are two falcons, while the frame of the spectacles is two entwined king cobras. There are also giraffes, dinosaurs, and an owl. And the wrinkles on the forehead are actually several snakes lying next to each other. “The qualities of all these animals are inside every human being,” explains Nazeer, one of Kerala’s top mimicry artists, who held his first-ever painting exhibition, “And we are the only animals who can live anywhere.”The polar bear, he says, cannot live in a place where it is hot and humid. “But a man can survive in a hot or a cold place. We also eat meat, snakes, dogs, frogs, hens and even elephant meat. We are flexible,” says the artist. Nazeer, who is also an actor, has given a bow to the two superstars of Mollywood. 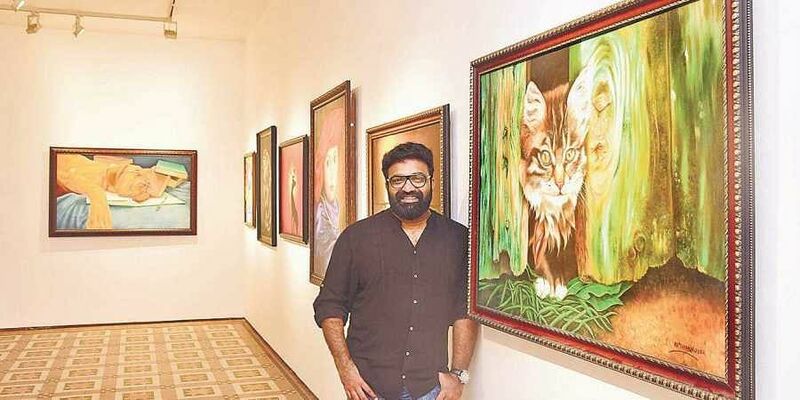 Standing next to a painting of a lion in repose, he says, “Mammootty is the lion for me: calm and determined.” Another image, of a tiger, also has numerous animals in it, including a fish, birds, an elephant, dog, goat, cat, rabbit, rat, a kangaroo with its baby, as well as an image of scientist Albert Einstein and poet Rabindranath Tagore. “I wanted to show that Mohanlal can play any role,” explains the artist. “To me, he is a complete actor.” Incidentally, Mohanlal’s blog is called ‘The Complete Actor’. In total, there were 54 works on display. It was a mix of acrylic, oil and watercolours. Nazeer’s strongest gift is his ability to draw piercing eyes that hold the viewer’s attention. “I have focused on the eyes because I feel that people express emotions through the eyes. No matter how you draw the face or the body, if there is no life in the eyes, then the painting will not come to life,” Nazeer explains. “I received a lot of prizes at that time,” says Nazeer. “Then I became interested in mimicry and that became my career.”However, Nazeer did not stop painting altogether. Whenever there was spare time on film sets or during international tours, Nazeer would take to drawing. Today as he debuts as a painter, a new career beckons.